As his Nurse in 2008, I stood by an Orthopedic Surgeon who was having a first time consultation with his patient. He examined the xrays of both knees which revealed there was no cartilage left. She had bone on bone as the saying goes and no cushion which is extremely painful. Point blank he asked her, "What is it you would like for me to do for you?" She looked a little surprised at him asking HER but she answered: I think I am mentally prepared I would like to go ahead and plan for surgery because it has become so painful to walk or do most anything." Again, to her surprise, he said, "I can't operate at this time until you are willing to lose at least 80 pounds as you would be a HIGH RISK for surgery." When the visit ended, he shook her hand, and said, "I hope to see you back when you are ready." Her fate was in her own hands. The point to this is "Why wait until we are in misery and then find we have reached a CRISIS point? Many times you hear people saying, "I just have no motivation …. My Mojo is on vacation!" On the journey, I have found MOTIVATION can work in a positive way OR you can take a negative situation and stir yourself up that way too!! .. I like to feel good! I like to exercise because I feel energized! I like my clothes fitting well. I feel happier and stronger when I exercise and eat healthy. It eases pain and stiffness. "I just DON'T LIKE TO EXERCISE and I DON'T HAVE TIME ANYWAY!" "I LOVE fast food and don't have time to shop or cook!" "I keep having to buy larger bras and they still cut into my shoulders and more!" Think of how hard it is to pack around extra weight as if carrying a back pack full of rocks! Why let things pile up until we can hardly function. If we wait for someone "else" to take care of things, we may wait a lifetime because it didn't happen that way! And do we wait until the 'last minute' to take care of things, or establish a routine that works on a daily basis? Don't wait for a crisis or an emergency to be your turning point. Just some thoughts because there really is always a way for improvements and change if we want them badly enough. And, as KALIGIRL posted after reading: "We don't know what we've got til it's gone." ….So let's hang on to our health and do all we can to preserve it! Thanks for stopping by friends and have a great day! Thank you. what you said is so true and it really hit home to me. I needed this reminder it may not be easy but it is possible. Great blog with lots for food for thought. This is a good reminder for all of us, 2B! Spark gives us the tools to help us monitor our progress, and our friends here can help keep us motivated with their friendship, encouragement, and support. It is each one of our choices that move us closer or further away from our goals. If we can look at each one, individually, without getting overwhelmed by the bigger picture, that should help us. SparkPeople helped me go down 80+ and I aim to keep it off! I joined the July-Jan. challenge. 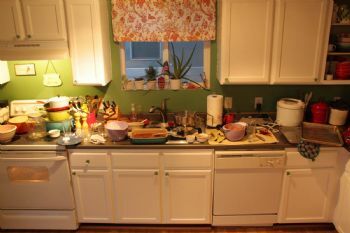 First month Set-up for success - Organize my Kitchen! Inspiring! I have indeed let some things pile up in some parts of my life. I just need to keep chugging along in a positive direction! I was at that crisis point, though none of my medical providers came right out and said anything... it was only after I had lost 100 pounds that my visiting nurse stated she hadn’t expected me to live another year... and yet here I am over 7 years later, because I made the decision to change my life due to a general sense of misery. This blog is very motivating! This Blog resonates with me on so many levels. I took an A& P Class and the Dr. teaching it said that if he could prescribe the number one thing to keep people healthy, it would be exercise, and a balanced diet. Waiting until you are in pain and a train wreck is not the way to go. Thanks for sharing so encouraging. I resemble all of those NEGATIVE responses and I was that way for years until the car accident and I realized that things could be a lot different and God got into the mix of things and BAM!!!! That's exactly what God did, He Brought A Miracle (BAM)!!!! Had it not have been for that miracle I wouldn't be living today and I choose to honor Him by keeping this temple that He has loaned me as fit and trim as possible. Well said. I agree. Routine for me has helped me reach my goals and be consistent. Living each day to the fullest because we don't know what is a happening tomorrow. Great blog and oh so true. I need to be serious about this. Thanks for giving me the incentive to do something about the few pounds I have put back on. Inspiring post and good kick in the tush. I have been consistent with exercise and eating right, but had fallen into a rut in that I wasn't pushing and diversifying. I was walking a lot outdoors which I find calming and still do. At the gym, it was the same machines-all good, but not challenging different muscles and rarely breaking a sweat. Finally went back to Zumba and it has awakened me and my muscles! I am back to being excited about exercise and even and really pushing and sweating. Plus, it really helps me manage stress and stay positive. I do home health care now. One of my clients moved into assisted living a month ago because she just could not bring herself to lose enough weight to make surgery for her bone-on-bone osteoarthritic hip safe. I feel for her - how can you give up the love of your life, food, when you are bedridden? Trading immediate gratification for long-term gratification is not easy for some of us. The good news is that modern ortho surgery makes recovery from knee and hip replacements pretty amazing... if you can get qualified for the surgery. A great blog. Thank you. Life is sometimes hard, but most would not give up living. Everything is about choice. What you choose reflects how you live. Your blog describes my sister to a T. She tried 3 or 4 various diet plans, but did not change her lifestyle, ate a lot of fast food because she was "too busy" to take care of herself. Sadly, at age 53, she still had not had knee replacement, was using a walker, and developed repeated cases of cellulitis . Eventually she went to a motorized scooter, even inside her home. She has been permanently disabled, and because of repeated hospitalizations and additional health issues now relies on her husband and health aides to get her up and out of bed using a hoyer lift. She would be the first one to say "change your lifestyle, don't make the poor decisions I made"! I am in the same boat as she was. Great blog! So true, we put our backs out ,we twist our ankles, we have surgery and the whole time you're laid up you're thinking..wow why wasnt I taking care of myself when I could!? A 1lb per week challenge till the end of the year sounds GREAT! Thanks for this inspirational blog!